It's not what most people expect to see when they're swiping through their selfies. 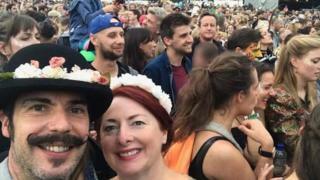 At the Wilderness Festival near his Oxfordshire home this weekend, David Cameron photobombed a Labour activist's selfie, along with his wife Samantha. Enjoying a star line-up which included Bonobo and Grace Jones, Vanessa Price was capturing a cheery moment with her husband, unaware that the former Tory MP for Witney was crashing their photo with a deadpan expression. "I couldn't believe he was staring at the camera - I don't think he was having a good time," Mrs Price said. The festival, which has a reputation for being posh, is not your average burger vans and plastic beer cups affair. Celebrity chefs provide fine dining and revellers can book a lakeside spa. There is even a Sunday cricket match if the music is not to your liking. But its reputation doesn't deter Labour supporters from partying at the festival or from hugging former conservative leaders. Art consultant Lucy Edwards got her own snap with Mr Cameron. The Camerons' appearance at the festival came in the same week that Conservative MP George Freeman announced he was planning a festival of ideas for Tory party activists in September. The idea came after Labour's Jeremy Corbyn stole the show at Glastonbury this year, Mr Freeman told the Financial Times. Can we presume that Mr Cameron will be attending "Tory Glastonbury"? Maybe it depends on the line-up. Video How posh is Wilderness Festival?